The latest batch of video game ratings by the ESRB reveals a listing for Konami's classic RPG Suikoden that may indicate the title is destined for a PlayStation Store re-release. 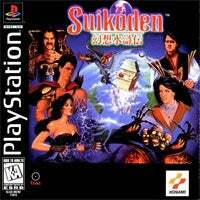 Suikoden is rated as released—or to be released—for both the PlayStation 3 and PSP, as with other PSN releases. We don't know when it's coming—PS One Classic releases are few and far between in North America—but it's most likely coming. You may be able to secure a hard copy for the standard asking price in the meantime anyway, so act accordingly.